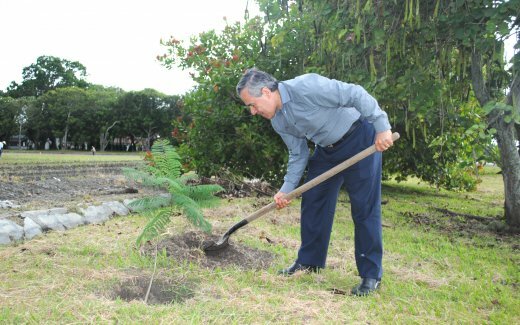 Walter Vergara is a forest and climate specialist working on the Global Restoration Initiative in Latin America. He is a senior fellow at the World Resources Institute and leads the 20×20 Initiative, a country-led effort to restore 20 million hectares of land in Latin America and the Caribbean by 2020. Can you tell us what the 20X20 Initiative hopes to achieve? The 20×20 Initiative was launched by eight countries and five investment groups in Lima in December 2014 during the COP 20. Our objective is to address land degradation in Latin America and the Caribbean (LAC). I’m very pleased to report that by July 2017, the 20×20 Initiative received pledges from 16 countries to restore more than 52 million hectares of degraded land! What were the driving forces behind the formation of the 20×20 Initiative? There were many driving forces, but it was the extent of land degradation in LAC and its knock-on effects that directly triggered the 20×20 Initiative. It is estimated that LAC has up to 200 million hectares of degraded land because of unsustainable practices such as excessive or inappropriate agricultural exploitation, poor animal husbandry practices and unsustainable forestry. We are now left with large expanses of exhausted land and a massive loss of topsoil. We see huge decreases in carbon and nutrient content in soil, a loss of vegetation, water resources and biodiversity. We needed to act fast and this was how the 20×20 Initiative was created. What are some of the Initiative’s achievements so far you are most proud of? I’m very pleased and proud of the scale of uptake. Since 2014, 16 countries in Latin America have joined forces, together aiming to restore 52 million hectares. We have 17 financial partners investing hugely in risk capital in more than 30 projects across the continent. What is the role of the business sector in large-scale reforestation? The business sector is crucial to achieve large-scale reforestation. Without its buy-in, not only will it be difficult to obtain enough funding, but we need businesses to be involved if we want to change the way things are done. Private financial partners and impact investment funds have pledged $ 1.7 billion to finance 20×20 Initiative’s land restoration efforts. This clearly shows the business sector’s commitment to restore land on a massive scale. Have you seen a change in the global understanding and support for restoring land during your career? Yes, there has definitely been a substantial increase in the understanding of the issues around land degradation and its effects. There is now far more support for land restoration and a recognition of its role as a cost-effective measure to mitigate polluting emissions and boost biodiversity. We must fully eliminate carbon from our economy. This is becoming increasingly urgent as the consequences of climate change become clearer. I would say that Latin America and the Caribbean are probably closer to zero emissions than many other regions in the world. Our power generation is already largely driven by renewables and more people travel by public transport here than anywhere else in the world. If we can halt deforestation while continuing to stimulate large-scale reforestation, the future will look bright for Latin America. It goes without saying that the 20×20 Initiative will continue to support this goal.